?Journey's End: The Memories and Traditions of Daisy Turner and her Family" follows the story of the Turner family--as told by 100 year old Daisy Turner--from shipwreck off Africa, to slavery on a Virginia plantation and eventual freedom on a Vermont farm. Daisy's stories, and those of her nephews Bruce Turner and Godfrey Hall, cover four generations of African-American experience dating from the mid 19th century (including stories of slavery and the Civil War) to the final decade of the 20th. Daisy Turner of Grafton, Vermont, was a remarkable individual. When folklorist Jane Beck first met her in 1983, it was clear that her stories must be recorded. Over a period of a year, Jane devoted one day a week to interviewing Daisy. These tens of hours of tape-recorded conversation gave Jane a solid basis for developing the Peabody Award-winning radio series "Journey's End: The Memories and Traditions of Daisy Turner and her Family." Daisy Turner's storytelling had long been appreciated by members of her family and her Grafton neighbors, but Jane Beck felt strongly that it was important to present her stories to a larger audience. 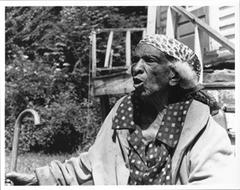 Not only was Daisy a master storyteller, but she was also an African American; her stories vividly portrayed her family's experience under slavery in the American South, reaching back even to her grandfather's youth in Africa. As Daisy often explained, "See we didn't just come from nothing and nowhere, we've got a background, and the background can be traced right down to the roots." Because white society, and by extension, white historians have overlooked, denied, or even suppressed the history and cultural traditions of African Americans, it is essential that the stories of people like Daisy now see the light of day. Daisy Turner died in 1988 at the age of 104. The story of Daisy's grandfather Alexander, whose parents were a shipwrecked English merchant's daughter and an African chieftain's son. In this episode Alec Turner's mother, Rose secretly makes a pair of red moccasins for Alec with disastrous consequences. Alec Turner guides the First New Jersey Cavalry on a raid of the plantation that had been his home. Daisy recites a Civil War-era poem--a doctor's letter to the parents of a dead soldier who was his comrade in arms. Alec and Sally Turner lived for a time in Williamsburg, Maine, as members of a colony of freed slaves who worked in the Merrill slate quarry there. Alec Turner and his wife, Sally settle in Vermont on the farm he called Journey's End. In this episode Alec Turner accepts a challenge and performs a dramatic feat of strength. As a girl, Daisy Turner faces discrimination at school and confronts it directly--with poetry. When a Boston market owner attempts to cheat her father, Daisy travels to Boston to confront him. Daisy and her father were so close that she felt they could communicate psychically. This program details such an event. At 40 Daisy became engaged to Joseph Bonet. When he later broke off the engagement, Daisy sued him--and won! At the time of Alec Turner's death in 1923, Journey's End had been his home for 50 years. Daisy Turner was proud of her heritage and understood the value of her family tradition. This is the concluding program in the series, Journey's End.